From the origins of the art to personal techniques, you will experience the impact the Gracies have had on jujitsu and learn the strategies they have developed to dominate their opponents. Gracie shares the subtleties of the techniques necessary for mastering the art, and he clearly demonstrates the flow of movement with more than 250 high-quality photos. Not only will Mastering Jujitsu help you progress from isolated skill development techniques to a full set of tactics and fight plans, but it will also introduce you to the concept of combat phases and teach you to attack from any phase. Saulo Ribeiro—six-time Brazilian Jiu-Jitsu World Champion—is world-renowned for his functional jiu-jitsu knowledge and flawless technique. In Jiu-Jitsu University, Ribeiro shares with the public for the first time his revolutionary system of grappling, mapping out more than 200 techniques that carry you from white to black belt. Illuminating common jiu-jitsu errors and then illustrating practical remedies, this book is a must for all who train in jiu-jitsu. The best technique book of the list! The book is organized uniquely in sections by belt level. Saulo offers a great perspective and philosophy of what students should focus on each belt level. 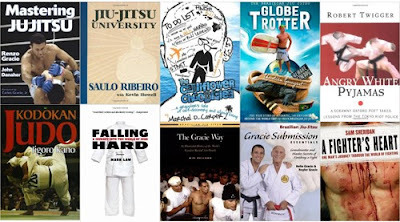 The history of judo (the antecedent of brazilian jiu-jitsu) and a glossary of the techniques of the Judo gokyo. Really useful to help remember the Japanese names of the throws you learn in bjj class. On his fiftieth birthday, British journalist and self-described “indolent sportsman” Mark Law decides to take up judo on a whim and ends up getting hooked on the sport. Falling Hard is Law’s love letter to judo—the culture, drama, history, and practice. With journalistic zeal, he delves deeply into the sport’s history and lore, and interweaves his own judo experiences with the development of judo in Japan, the life and vision of its founder Jigoro Kano, the export of judo to the West, the emergence of women in the sport, and detailed descriptions of competition on the world championship and Olympic levels. The author offers a fresh and humerous account of his own discovery of judo. The Cauliflower Chronicles follow Carper’s adventures and misadventures, both on the mat and around the island. Read more about new books in our next publication.